Happy Bloggers Challenge Friday! It's that time again, Back to School! Such a perfect theme for this weeks Bloggers Challenge, don't you think! I know many of my friends children have already gone back, my boys went back yesterday, and the local grade schools start next week. I'm looking forward to getting back into a daily routine, and I know they kids were excited to see some of their friends they haven't seen all summer! While my card is not a "welcome" back to school, it's still school themed. The school themed images are from Kitchen Sink Stamps 3 Step School Days. You can find details on how I created this card on page 60 of the October 2010 Issue of Crafts 'n Things. Thanks for stopping by, if your looking for more BTS inspiration, click on the Bloggers Challenge Logo on my sidebar to see what the other players created this week. Here's the annual BTS photo I took of the my boys! I have them stand in the same spot each year, it's fun to look back on them and see how they've grown. Awww... how cute are your photos! Your boys are very cooperative to stand for a photo as high school students. my son (who is going into 11th this year) would not tolerate a back to school photo - even if I begged him! And how cute were they 10 years ago! Love it! I also love your card. Great back to school theme! Great card, I love the Job Well Done sentiment-perfect for this card. Luv your card! Luv those boys and the photos. Love that photo of your boys! I think your card is perfect for BTS! Have a great weekend! Love it. I do the same thing with my son and it is so fun to look back. Our kids don't go back until Sept. 7! Congrats on the publication again. By the way the boys get more handsome each year! Love the photos of the boys. My two are a senior and junior this year. The time surely flies...way too fast! Your card is awesome! I love those KSS stamps...the attention to detail is incredible! I had to chuckle at the difference in first-day-of-school clothing, too! 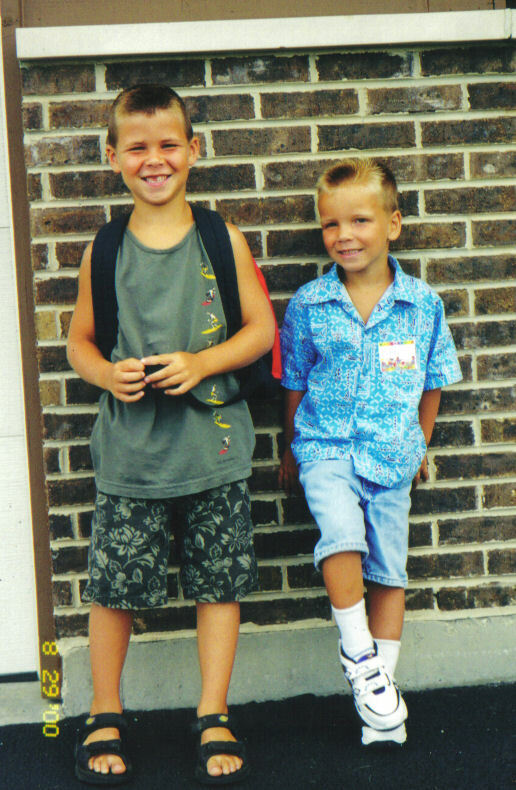 I like the idea that your sons still let you take that first-day photo! Your card is great....I really like that retro chalkboard look with the Core-dinations and the embossing folder. Of course, the KISS image is wonderful, too. Fabulous card - Love the background and how the Red Apple pops with it. Great photo's of your sons. I did that with our kids and now I'll be taking photo's of Coleen the same way. Love your school card. It's a very appropriate school theme. And your boys are so handsome. This was a cool post. Great background for this card...it makes the red apple pop! Your flashback photo is adorable--lovin' the crew cuts! Excellent card, great theme, Lisa. I loved seeing your boys and it is amazing to see how the 'little' one is now the same size as his brother. Great idea. I can hear the "oh, no...not again, mom". lol. I used to do the same thing!!! Each tear is a record of the lunch boxes they chose and their favorite t-shirt!!! Great idea for theme. thanks! How darned cute are those boys? And those early photos are priceless -- love that grin on your older son! Fabulous card too -- love the alpha popped out there and showing! What a wonderful card Lisa! I love the numbers in the background and the stamps are so realistic! The picture of the boys is so darn sweet and so net to see the pics together of the guys when they were little! So darn cute! Great idea taking the picture every year of them standing together. Such a cute school card, love it! Your card is wonderful and your memories are sweet memories! Thanks for sharing them both with us! GREAT flashback photo of the boys...wow, so fun to see how they've grown up! LOVE your card. The sanded background looks like a chalkboard and I LOVE the colors of your images!! Fantastic card. Love the embossing that works with your wonderful stack of books and apple. Love that you shared the pictures of the boys from this year and when they were little. I too have a spot for my kids for their first day of school. I love the card. The pics of your boys are great too! Love the school themed card, Lisa! The sanded background works perfectly with those KSS images. And the photos of your boys are so fun--loved seeing how they've changed over time.